I've met two kinds of photographers in my travels. There's the Frugal Photographer who eagerly tries all the cheap and free photo tools. These folks scour the Web for freebies like Windows Live Photo Gallery and Google's Picasa. They use programs like Paint.NET as a free alternative to commercial programs like Adobe Photoshop. And they like hearing about one-trick photo tools that do interesting things—for free. Then there's the Snobby Photographer. These folks won't consider using a program that doesn't have a three-digit price tag. Sure, the can justify that decision by claiming that cheap software doesn't have the highest quality JPEG rendering algorithm or it's missing some high-end color management feature. But let's be honest: We don't always need the Space Shuttle; sometimes a hot air balloon is more than enough to get the job done. It's in that spirit that I wanted to remind you about a perfectly cromulent photo tool that comes in every edition of Windows: Microsoft Paint. Just about everyone has fiddled with Paint, if for no other reason than it comes for free with Windows and it gives you something to do when you're learning your way around the operating system. Some people, though, have taken Paint to a whole new level. Check out this stunning picture on Deviantart.com, for example: Believe it or not, it was created entirely from scratch in Paint. Need to make a photo smaller? I do it all the time—for e-mail, for publishing images on the Web, and for including in documents. It's a snap to do this in Paint. 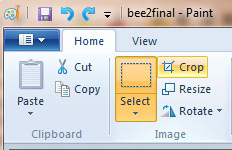 Click the Resize button and enter the new size you want. You've got some options: You can size the photo to a specific number of pixels or just specify what percentage you want to resize by. 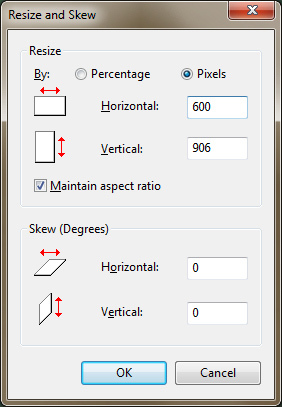 And while you'll generally want to keep the aspect ratio of the photo intact, you can clear the check box for "Maintain aspect ratio" and distort the photo by setting different values for Horizontal and Vertical. Of course, Paint lets you spin the photo around as well—something you might need to do if someone sends you a photo lying on its side, or your camera doesn't automatically rotate photos when they're copied to the PC. Just click the Rotate button and choose the direction and amount of the rotation. You already know how to make the photo bigger or smaller, but what if you want to add some white space around the photo—in other words, make the canvas bigger without enlarging the photo itself? To do that, click the menu button to the left of the Home tab and then click Properties. 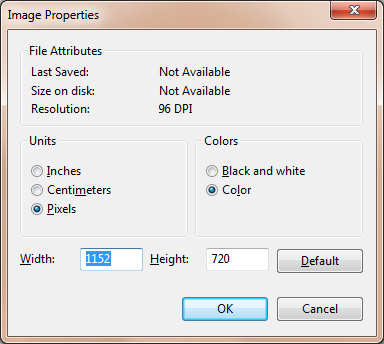 At the bottom of the Image Properties dialog box, you'll see the current size of the photo in pixels. Need a border? Enter larger numbers in the Width and Height fields and click OK. Paint will add those extra pixels added as a plain white background to the right and below the photo. Want to center the photo in the new canvas? Select it (using the Select button and the Rectangular Selection tool) and drag the photo to a central location on the canvas.